A: I’m originally from Southern Ohio, which makes me a Midwest farm girl. I owned and operated a large show horse farm, which had a lot of dogs, cats and other animals. Q: Why did you open your business in Ahwatukee Foothills? 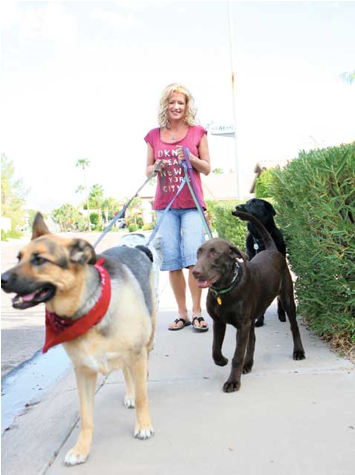 A: I found Ahwatukee to be clean and friendly. Although it’s a large community it felt like home. A: I realized I could not have enough animals to love and care for! A: I offer in home care for pets, potty breaks, walks, vacation visits, day care and kennel-free boarding in my home. Q: What does your business offer that no one else does? A: I offer personalized care for your pet, whether I’m taking care of the animal at a client’s home or in my own home. Q: How have residents of the community responded to your business? A: I was shocked at the response. What started out as a labor of love turned into a successful and fun business. A: I welcome the opportunity to grow my business but will never forsake the individual attention I offer. A: I feel that I offer a unique boarding service. It is not a kennel but, instead, a home where pets live with me in my home as they would in their own homes. Barbara Drummond has traded in her show horse farm for the slightly more tranquil business of pet sitting – although having more than a dozen dogs in her home on a recent weekend might offer a counter argument. Drummond, from Ohio, operates Home Alone Pet and Home Services in the Lakewood area.